Leaves an enticing scent along the trail to bring deer into your crosshairs. Use this Rub-On Scent Stick to "flavor" your surroundings on the next hunt! Strong scent lasts for up to two years. No spills, no leaks. Easy to apply, too…just rub on your boots, surrounding foliage or trees, slice small pieces onto the trail, or leave the applicator out without the cap to fill the air with irresistible aroma. 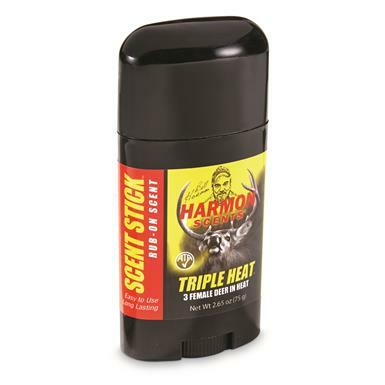 Harmon Scents Triple Heat Rub-On Scent Stick is rated 4.8 out of 5 by 11. Rated 5 out of 5 by Deerslayer from Basic and Affordable This is a no brainer, uncap ,rub absolutely anywhere and recap and continue on down the trail, no mess! Also price is a third cheaper than the other brand. Rated 5 out of 5 by HunterBrian from Outstanding product! I used this product for three days straight on my boots and walked different routes in the same area. I found deer tracks in my footsteps shortly afterwards. The last day the buck I shot was following my tracks exactly. I'll use this product from now on and recommend it to every hunter I meet! Rated 5 out of 5 by Mort1022 from Fast shipping ....easy application with multiple uses without spill ! Rated 5 out of 5 by rocky1111 from Love the stick, easily applied to boots, you can use it also by leaving it open at the stand. Take your boots off before you get back in the vehicle. Rated 5 out of 5 by Cindy from No Mess Really smelly solid that doesn't drip all over my gloves. Hurray! Turns up and down just like deodorant and the cap fits tightly. Don't know if it's going to attract bucks yet. Rut hasn't begun here in the south. Rated 5 out of 5 by Pistolero from Good product Smells like the liquid scents but easier to use, won't spill in your pack or pocket and it lasts for 2 years. Brings them into pistol range and holds their attention very well. This will save me $ over the next couple of yrs. Can't beat the price! Rated 5 out of 5 by sheds188 from love this stuff,easy to use triple heat is good stuff,easy to use,strong esterous smell and can put it on anything,your boots,trees.limbs,brush,just about anywhere.thing I like about it the best,one stick lasts a long time instead of liquid that is gone in a minute!! highly recommend!! Code Blue® Screamin' Heat Doe Estrus. Wash away stink and grime from the get-go!